My Review: This is the story of the Final Frontiersman, Heimo Korth, an expat from Appleton, Wisconsin. Heimo (pronounced HI-mo, long i and long o with the emphasis on the first syllable) grew up in a typically dysfunctional family, with a mean and violent father. As a boy, he sought refuge in the fields and forests surrounding his home, becoming comfortable with the ways of nature. After dropping out of school, Heimo went to work as a welder in a local factory. He hated the nature of the work and the confinement of being indoors on an eight to five schedule. To cope, he spent many hours consoling himself in the local saloons. In 1974, Heimo finally made the break he had dreamed of all his life by quitting his job, empting his bank account and heading for Canada’s northern territories. His dream was quickly thwarted when the Canadian authorities did not welcome him with open arms. A young, longhaired American youth heading into Canada in 1974 raised the suspicion that he was a draft evader. Quickly revising his plan, Heimo headed for Alaska. Himo’s first years in Alaska remind me of Christopher McCandless, the young American, full of romantic notions about living in the wilderness, who looses his life in Jon Krakauer’s book, Into the Wild. The difference is that Heimo actually possessed some knowledge of the outdoors. His romanticism was tempered by experience and a keen survival instinct. Heimo also asked questions and showed that he was eager to learn. As a result, he was taken under the wing of several veteran trappers and woodsmen. Heimo could have died many times during those first few years alone above the Arctic Circle, 150 miles from the closest settlement, eking out a subsistence existence. But he did survive and thrive. After six years spent mostly alone in the bush, Heimo married Irene, an Eskimo woman from a small village, Savonga. Heimo had known Irene for some time, having visited her village almost yearly to hunt with the locals. Irene joined him in his subsistence existence in the bush where they raised a family. They lived in a small, one room 12 by 14 foot log cabin, with no running water or indoor plumbing. They heated with wood, and it was not unusual for temperatures to drop below –35 degrees for days at a time. They lived by foraging for food, hunting and the money earned from trapping. The children, two surviving daughters, were home schooled by their mother. A third child, their first, died in a terrible accident that nearly took the life of Heimo and Irene as well. While I don’t rate this book at the top of my all time best list, I did find it very interesting. The author, James Campbell, is Heimo’s cousin. As such, he brings both a journalist’s objectivity and a relative’s insight to the story. He was probably able to get closer to Heimo and his family than others might have because he grew up in the same town, knew many of the same people, and shared relatives and cultural experiences. As a result, we get some depth of feeling related to characters and incidents that might otherwise be lacking. This book is a great tale about perseverance and survival in a stark and beautiful land, and of a man who made a life there against all odds. 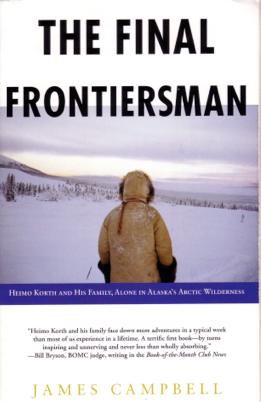 Heimo Korth may indeed be the last of his kind, the Final Frontiersman.